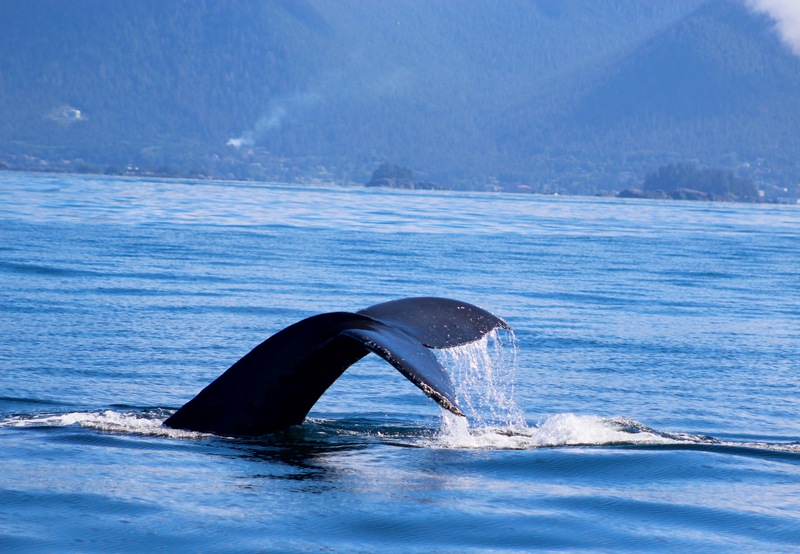 A Southern man digesting life on the fringes of D.C.
Whale tail in Sitka, Alaska. I am on a black sand beach on an Alaskan island. A bright orange bear whistle dangles from my neck. My wife Robyn is also sporting a bright orange bear whistle. Bright orange bear whistles go with exactly nothing we are wearing but are indispensable nonetheless. The small boat that dropped us off on the island is receding in the distance. Our guide explains that if we come across a bear we should blow the whistle. “Don’t run,” he says. “Running from a bear is like throwing a ball for a dog. It just makes them chase you. If you do run, please don’t run toward me,” he says. I imagine encountering a bear and blowing the whistle. The bear might be startled and run away from the sound. That could happen. But it’s a certainty that the eight other tourists on the beach will head in a direction opposite to the sound of the bear whistle. We start wandering around on the beach. This is why we came here, to see things we wouldn’t see if we stayed put. Robyn picks up a few shells. I spot some prints in the sand. There are small precise prints from a deer. Another set of prints that look like a large squirrel. And a deeper impression of prints that look like something else. The guide confirms that I’m looking at deer prints, sea otter prints and bear prints. “He’s about 300 to 400 pounds. And those were made less than two days ago. I know because we had rain two days prior,” he explains. I manage not to blow my whistle.